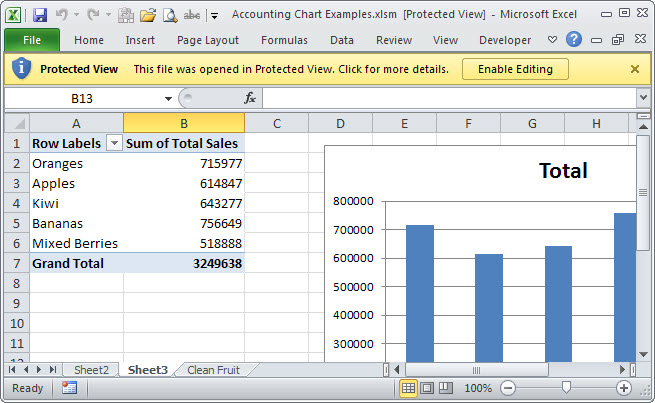 Little Known Techniques for Opening Excel Files » Accounting Advisors, Inc.
Every Excel user knows how to open a spreadsheet: Click on File (or the whimsical Office button in Excel 2007), choose the Open command, select a file, and then click the Open button. In this article, I'll explain several hidden techniques that can give you more control over unfamiliar spreadsheets. Before we get to the specifics on the hidden features, first double-click on the title bar of the Open dialog box in Excel. This expands the window so that you can see more files without scrolling from side-to-side. Simply double-click on it again to restore it to its traditional size. 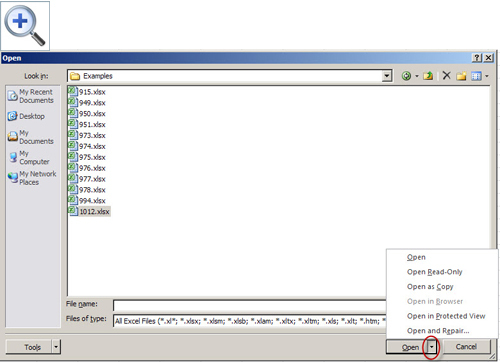 Figure 1: Many users overlook the submenu within the Open button. Open: This is the same function as clicking the Open button, so choosing it would simply add extra mouse clicks to your task. Open Read-Only: This opens your file in a read-only state, so you can't accidentally save over the original. It's a great option to keep in mind when you want to look at a document but not necessarily create a new copy or save your work. Open as Copy: This creates a copy of your document in the same folder as the original, but prepends Copy(x) before the file name. Unlike the Read-Only option, you can save changes to this document. Open in Browser: This option becomes available when you click once on an HTML file within Excel's Open dialog box. The file you select will appear in your default web browser. Open in Protected View: Excel 2010 and later offer a Protected View feature, which you can use to open unfamiliar documents in a sand-boxed mode. In Protected View you cannot make any changes, and any data connections or macros are disabled until you click the Enable Editing button shown in Figure 2. If you close this toolbar accidentally, you can also choose File, Info, and then release Protected View should you need to edit the document. 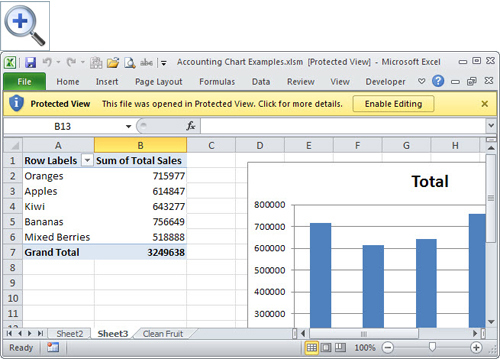 Figure 2: Protected view allows you to safely open unfamiliar spreadsheets. Open and Repair: Available in all versions of Excel, this hidden command may enable you to open workbooks that Excel reports as corrupted. Unless you need one of these special features, I recommend that you double-click on a file name and skip the Open button. There's one other trick that must be accomplished outside of Excel's Open dialog box. 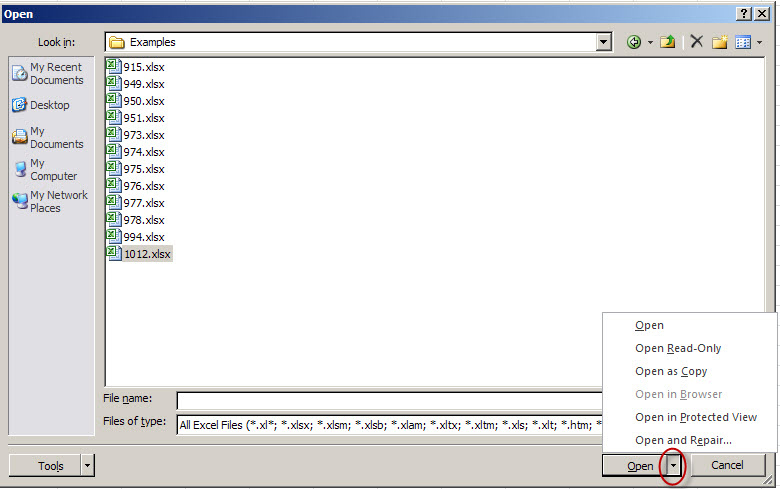 As shown in Figure 3, you can right-click on an Excel file within a Windows Explorer window and then choose Print. Windows will launch Excel if necessary, print a copy, and then close the document, and close Excel if it wasn't previously open. This is a handy technique for grabbing a printout on your way out the door to a meeting. 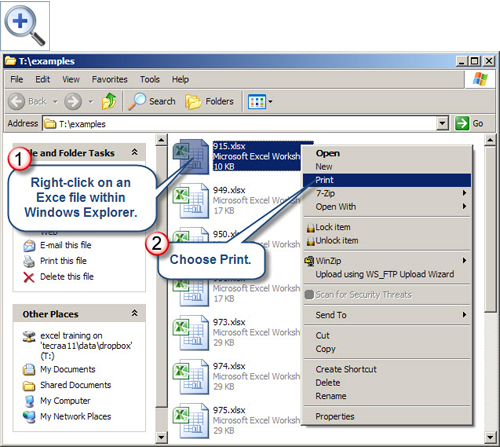 Figure 3: You can quickly print an Excel document from a Windows Explorer window.